The human body is exposed to various toxins through the food we eat, the water we drink and the air we breathe. Aqua Foot Detox treatment is used to detoxify and cleanse the body of these toxins. During the foot detoxification process, you will be asked to place your feet in a tray of lukewarm water, which has a small amount of salt. The system is then switched on which produces positive and negative ions in the water. Your body absorbs these ions and neutralizes the tissue waste, which is released into the water from the feet. This is indicated by a change in the colour of the water and sedimentation. This procedure takes about 30 minutes and you will be advised to drink a lot of water after the treatment as the detoxification process continues for about 48 hours after the treatment. Benefits of the aqua detox may include higher energy levels, healthier body, stronger immunity, less body pain, fewer allergies and improved sleep. Hypermobility: Excess looseness or movement in the 1st tarso-metatarsal joint leads to instability, causing the first metatarsal bone to move in one direction. To compensate for this, the toe shifts in the other direction leading to a bunion. The diagnosis of a bunion includes taking a medical history and performing a physical examination to assess the extent of misalignment and damage to the soft tissues. Your surgeon will usually order weight bearing X-rays (i.e. taken while standing) to access the severity of the bunion and deformity of the toe joints. Mr Limaye will recommend conservative treatment measures with the goal of reducing or eliminating your foot pain. There are many surgical options to treat a bunion. A surgical procedure called the Lapidus procedure is indicated to correct a bunion caused by hypermobility of the 1st metatarsal bone. The common goal is to realign the bones in the foot, correct the deformity, and relieve pain and discomfort. The surgery is performed as a day procedure, under the effect of a light general anaesthetic and a regional nerve block. When you wake up, you will not be in pain and will be able to walk on your foot right away. The shift in the metatarsal joint causes the imbalance in the soft tissues – elongation of medial ligaments and capsule and shortening of the lateral tissues. To correct this, an incision is made at the web between the thumb and second toe and the adductor halluces muscle, lateral joint capsule and transverse metatarsal ligament are released. Another incision is made at the first metatarsophalangeal joint. The joint capsule is opened, the bony prominence or medial eminence removed, and the capsule stitched close to the bone to tighten the slack capsule, and correct alignment of the bones. Your surgeon either extends this incision or makes another incision along the top or middle of the toe and exposes the first tarsometatarsal joint. Underlying nerves and tendons are protected from damage. The cartilage lining the joint is removed and the bones are aligned straight. The metatarsal and medial cuneiform bone, the bones of the 1st tarsometatarsal joint, are locked or fused together. This position is held by screws and/or a plate. Bone graft may be added at the joint to further aid in healing. Your incisions are closed with staples or sutures and the foot is covered with a padded dressing and supported by a splint or surgical shoe. Elevate the foot to minimise swelling as much as possible. Your stitches or staples will be removed in the first month. At your next outpatient appointment, your surgeon orders X-rays to check for healing of the joint. Upon healing, you are allowed to slowly wean out of the post-operative shoes. Physical therapy is recommended to increase strength and improve range of motion in the foot. You can return to your normal activities in four to six months of the surgery. It is important to note that your recovery schedule and weight bearing protocol may vary based on your surgeon’s preference. After the operation, you are advised to keep the foot above the level of the heart for at least 24 hours to avoid swelling. The soreness and pain will subside with the help of painkillers but might stay numb initially for 6-12 hours. The wound should be regularly dressed to avoid infection and to facilitate healing. It should be taken care that no pressure is put on the toe while walking for the first 2 weeks. You can resume your regular activities after 2 weeks, but it might take 3 months to return to normal. You will be able to drive a vehicle after 6-8 weeks and can return to sports between 3-6 months. A Scarf osteotomy is a surgical procedure to correct a hallux valgus deformity, commonly known as a bunion. It is a very versatile procedure that allows the movement of bone across different planes. A Chevron osteotomy is a type of bunion correction surgery. It is effective in treating mild-to-moderate bunion deformities. ROTO glide total toe replacement is a unique 3-part implant that incorporates a sliding and rotating meniscus. It has been designed to optimize anatomical movement. 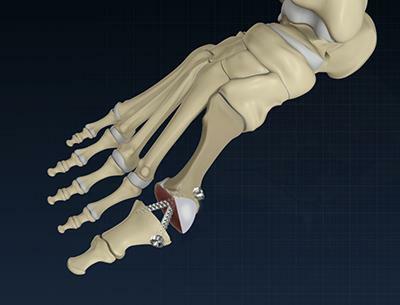 The Cartiva toe replacement has been approved for treatment of big toe arthritis. The implant is designed to replace damaged cartilage and reproduce natural function. The Swanson Flexible Hinge Toe Implant is a double-stemmed flexible hinge implant designed to restore function to the metatarsophalangeal joints disabled by rheumatoid, degenerative, or post traumatic arthritis. An Akin osteotomy is a medial closing wedge osteotomy of the proximal phalanx of the great toe. It is used to correct hallux valgus deformity. The metatarsophalangeal (MTP) joint connects the metatarsal bones (group of long bones in the foot) and bases of the proximal phalanges of the toes. The MTP joint at the base of the big toe is commonly affected by osteoarthritis or rheumatoid arthritis. In cases of osteoarthritis, the surface of the joint wears out and the adjacent bone thickens and forms osteophytes (bone spurs). This eventually leads to severe pain and stiffness in the affected joint. In cases of rheumatoid arthritis the bones in the joints are extremely destroyed resulting in swelling and severe pain. These conditions may cause the MTP joint to become predominantly stiff (hallux rigidus) or deformed (hallux valgus). Hallux arthrodesis is a surgical approach performed to fuse the MTP joint of the big toe to provide pain relief and improve function. Before the surgery, Mr Limaye may conduct a physical examination and analyse details of your medical history. Talk with Mr Limaye about any medications you are taking or plan to take. Arthrodesis is performed as a day-case procedure which doesn’t require an over-night stay in the hospital. The surgery is carried out under the effect of general anaesthesia or an ankle block using local anaesthetic. Your surgeon will make an incision over the big toe joint; trim the bony bump and remove the remaining degenerated cartilage around the joint surface. Your surgeon will then fuse the metatarsal bone and phalange of the big toe. The bones are held in position with the help of screws, metal staples or plates and the joint is stabilised. Following the procedure, you may have to use crutches and wear a wedge shoe for around 6 to 8 weeks in order to relieve pressure on the front area of the foot. Keep the foot clean and dry and protect it when you have a shower until the wound is completely healed. Avoid driving and long hours of standing for a few weeks. Elevate your operated foot for the first two weeks to promote healing of the wounds and to help alleviate pain. You may experience swelling of the forefoot for a few months. Exercise may be recommended to improve movement, flexibility, and to strengthen the foot. The InternalBrace can be used to correct flat foot deformity. It allows for reconstruction of the spring ligament complex which supports the medial arch of the foot. PIP (Proximal Interphalangeal) fusion is done to correct a fixed and painful deformity of the proximal joint of the toe. DIP (Distal Interphalangeal) fusion is done to correct a fixed and painful deformity of the distal joint of the toe. Morton’s neuroma surgery is performed to resect a small portion of an enlarged nerve at the ball of the foot. It is usually located between the 3rd and 4th toes. Tarsometatarsal joint refers to the region found in the middle of the foot. It is also called as Lisfranc joints. It is a junction between the tarsal bones (group of seven articulating bones in the foot) and metatarsal bones (a group of five long bones in the foot). A deformity in the tarsometatarsal region can be due to arthritis and traumatic motor accidents. Tarsometatarsal fusion is a surgery used to treat deformity in the tarsometatarsal region. During this procedure, tarsometatarsal joints (one or more small joints in the middle of the foot) will be fused together and made stiff. Tarsometatarsal arthritis is characterised by pain, functional impairment and midfoot instability. The appearance of bruises and swelling on the dorsal side of the midfoot are the commonly observed symptoms. The early stages of injury can be treated by analgesics, steroid injections and by wearing special footwear or casts. Tarsometatarsal joint fusion is recommended if all the non-surgical procedures fail to show efficacy in treating the injury. The pre-operative assessment usually takes 2-6 weeks. The doctor will first examine the physical condition of the foot by inspection and palpation (feeling with hands). You may be advised to get an X-ray taken. You might also be sent to get a CT or MRI scan done to provide more information about your condition. The surgery is conducted under general anaesthesia. One or more cuts of 3-4 cm are made on the upper or inner surface of the foot. The joints which are to be fused are opened up, reshaped and fixed together with the help of metal pins, screws or staples. The wound is the stitched closed and a plaster cast is applied from knee to toe (removed after 10-14 days). Bone grafting might be done in case of any gaps during the fusion. The bone graft can be selected from either the pelvis or tibia bone (strong bone below the knee). In addition to general anaesthesia (during surgery), local anaesthesia may be given to reduce the pain (postoperatively) or pain killers can also be advised. You will be asked to keep the foot above the level of the heart to avoid swelling. The wound should be regularly dressed and kept clean and dry to prevent infection. You will have to wear a boot for 12 weeks post-surgery and walk with the help of crutches or a walker. It might take 6-9 months to get back to the normal daily activity, play sports and drive a vehicle. An ankle osteotomy is a surgical procedure that involves removal of a portion of the bone in the ankle. It is usually performed to correct deformities and improve function of the ankle. Diagnosis of cavus foot includes a review of the patient’s family history. The foot and ankle surgeon examine the foot, looking for a high arch and possible calluses, hammertoes, and claw toes. The foot is tested for muscle strength, and the patient’s walking pattern and coordination are observed. If a neurologic condition appears to be present, the entire limb may be examined. The surgeon may also study the pattern of wear on the patient's shoes. Surgery for cavus foot is complex, and often requires two operations performed two weeks apart or even in the same stage. In the first operation, releases the tightest of the soft tissues in the arch is done. The rest of the tissues relax during the following two weeks. In the second operation, the doctor cuts and reshapes at least one bone using a bony surgery and moves several tendons to new locations on the foot to improve muscle balance. Sometimes in addition to tendon transfers, bony cuts and reshaping is required. Post operatively this is treated in a plaster cast. The FDL tendon transfer is indicated in patients that have an acquired and flexible flat foot deformity. The goal of the procedure is to relieve pain and restore the arch. Tendoscopy is a procedure that allows Mr Limaye your doctor to see inside the tendon sheath. It can be used to identify and treat problems of the tibialis anterior tendon. A flexor hallucis longus tendon transfer may be used to treat Achilles tendinopathy. The FHL tendon is excised and transferred into a tunnel of the calcaneous bone. Calcaneal fracture fixation is performed to reconstruct normal anatomy and mobility of the heel. Special screws are placed through small incisions achieve fixation of the fracture. Bony lumps/soft tissue swellings around the food and ankle are usually benign. Excision is performed in case of severe discomfort or malignancy and can usually be performed in the outpatient setting under local anaesthesia. Paediatric foot deformities in children include cavus foot, tarsal coalition, & clubfoot. Evaluation and treatment of such conditions takes into account the need to maintain the integrity of the growth plates to allow normal growth of the foot and ankle. A tendon transfer is usually performed to restore normal mobility and function in a joint. Foot and ankle tendon transfers make it easier for patient to stand, wear shoes, and walk.